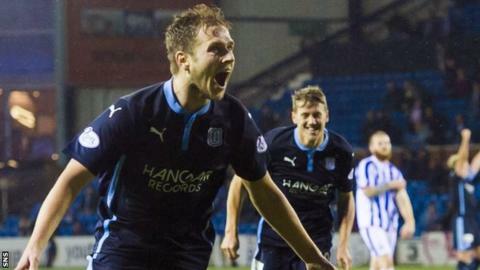 Greg Stewart has agreed a contract extension with Dundee after scoring 11 goals in 23 appearances since joining the Dens Park club in the summer. The 24-year-old striker, previously with Cowdenbeath, has signed until summer 2017 and manager Paul Hartley thinks the player will get even better. "I'm delighted," Hartley told Dundee's official website. "We are really pleased with the progress he's making and I'm sure he can only get better." Stewart had been with Rangers, Hearts, Falkirk and Stirling Albion as a youth but had a spell with Syngenta Amateurs before spending four years with Cowdenbeath. Dundee managing director John Nelms added: "Greg is a player that allows Paul to continue his effort to craft a versatile squad that will see Dundee competitive in the top-flight for years to come."